As far back as the 60’s, people recognized the potential of the waterfront as a park and in 1967, a Centennial Park Project was spearheaded by the Legion. In the 80’s, that interest resurfaced and volunteers started working on the area again. Cleaning up the beach area included pulling the old boom logs from the water; this led to the catchy name Pull-A-Log Park. In the mid 80’s, a committee formed to determine the improvements that would make the area more user-friendly. Land was cleared, trees and flowers were planted and an open air shelter was built and people began to spend more time at the park. Since that time, the park has been the center of Canada Day activities and in the winter, spectators gather to watch snowmobile races during the Winter Carnival. The Waterfront Development Committee also recognized the need for improved boating facilities. Around this time, tourism was identified as an untapped resource for the communities of the Northshore. The location of Red Rock, its natural harbour and a town wanting to diversify made it perfect for further development. What started as a project to improve the park for the use of the citizens of the community mushroomed into an economic development initiative of multi-million dollar proportions. Feasibility studies were done, a master plan was developed and from this, it was decided that there was need for a full-service marina with space for 220 boats. In addition, the park facilities would include a lighted board walk, play ground, picnic area and a viewing pod at the end of the berm. 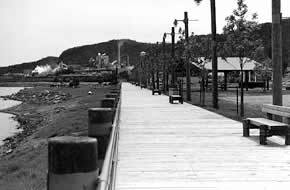 June 24, 1994, the official opening of the Marina, was a proud day for the citizens of Red Rock, especially those directly involved in the planning and development of the harbour front. The project has come a long way from its humble beginnings way back in 1967 and although there is still a great deal of work to be done, we have a wonderful facility to be enjoyed by citizens and visitors alike.